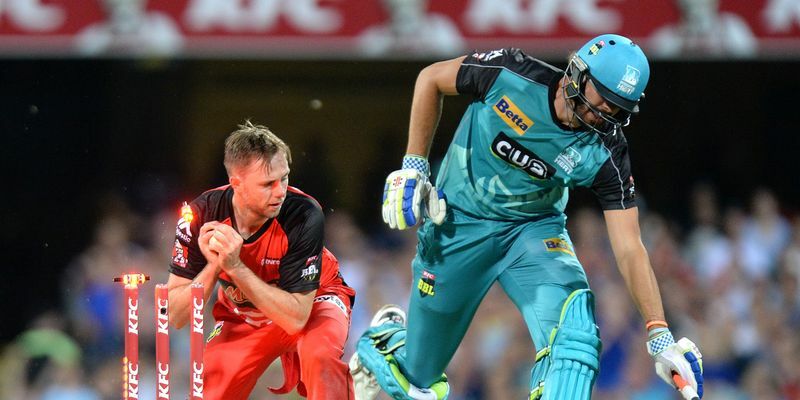 Two sixes, three wickets, four wides featured in an exhilarating last-over finish in the BBL match between Brisbane Heat and Melbourne Renegades on Friday. Needing 18 to win in the final over, Brisbane fell short by one run after Mitchell Swepson was run out off a wide ball on the last delivery. Batting first, Melbourne amassed 199 in 20 overs, courtesy a wonder knock of 71 from skipper Aaron Finch. Hosts Brisbane got off to a good start in the chase with Brendon McCullum providing the momentum at the top of the innings with 64. The match appeared to be within grasp of the home side, who needed 39 to win in the last four overs with six wickets in hand – a fairly easy target in this age. However, Brisbane lost three wickets in the space of seven deliveries between the 18th and 19th overs, and this turned the contest on its head. Needing 18 to win in the final over with three wickets in hand, Joe Burns smashed Nathan Rimmington for two consecutive sixes in the second and the third deliveries after the first ball was declared as a wide. However, Rimmington removed Burns and Nick Buchanan, and Brisbane required four runs off the last ball. Rimmington bowled a couple of wides, but in the second instant, Swepson was run out at the non-striker’s end attempting to steal a bye. The visitors won with that bizarre ending and climbed to fourth in the points table. Watch the final over here.